You have not lived until you’ve tasted the chocolate at Brick Lane’s newest and finest: Dark Sugars. Welcome to my new local hangout. You really can’t miss it. 1. Because the scent of glorious chocolate seeps half way down Brick Lane, and 2. because it’s on the corner just after you pass the famous beigel shops. I discovered this beauty whilst innocently Christmas jumper shopping in Rokit for my lovely (and super festive) mum, but as soon as I spotted Dark Sugars, all sensible thoughts flew out of my head and my mind focussed solely on THE COCOA! I wandered in not quite knowing where to start. 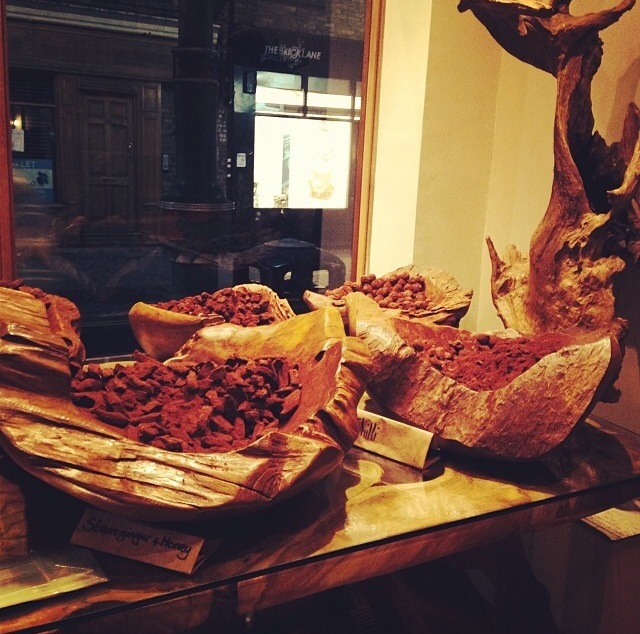 Greeted by large, misshaped wooden bowls filled with chocolate truffles that are created from scratch beneath the shop, it was like I had skipped the long haul flight to Africa and was already there! The door is always open regardless of the weather, jazz and soul music echoes throughout the shop and the warmest of atmospheres is created because of these things. 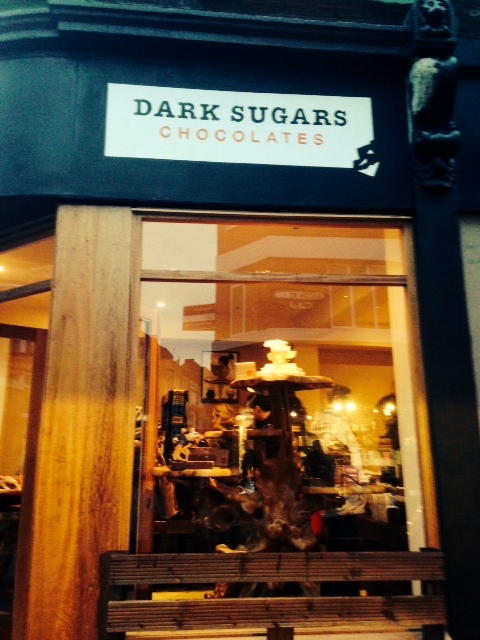 I had a lovely chat with the owner who told me the whole story of Dark Sugars. I can’t quite describe the passion he oozed when speaking, this was his dream come true and it made me appreciate how important it is to be truly happy in what you do everyday. Stacked up high are large slabs of chocolate, big chunks that you just want to get your teeth into! On the other side of the shop are the cocoa beans themselves; these pesky things you can just crunch away on. 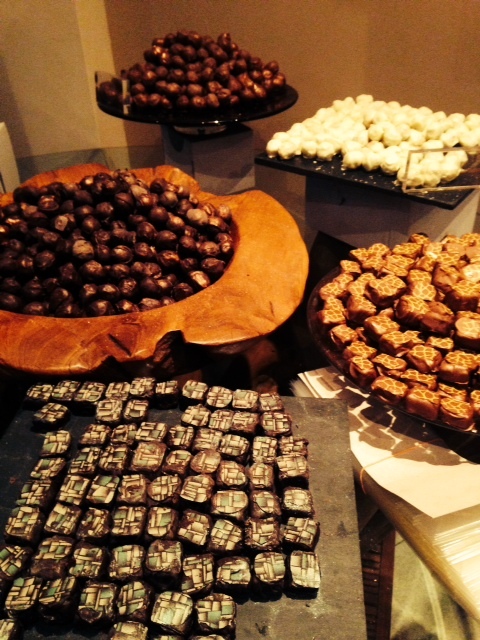 But the cocoa dusted truffles are my personal favourite. It is silly how good the flavours are. Stem ginger and honey, chocolate & chocolate (this one is…well, chocolatey), vodka & orange, cardamom, cognac, coffee & walnut and many more. On a separate glass table are the fancier ones with champagne and other delicious fillings. You can’t really tell from the photograph above, but these ones sparkle as if they have glitter on them…maybe they do, I’m not sure. If you’re trying to stay relatively healthy then I suggest grabbing a cardamom hot chocolate to go. They crush the cocoa beans themselves, add the crushed cardamom, cream, and whatever else is needed to make this a stunning drink to accompany the rest of your shopping trip. Enjoy…and spread the word! emmarushe on Plus size models…really? How many things can you fit into a weekend? Beautiful view of our office at the Heron Tower ey? Christmas Crackers & Caramel Puds!